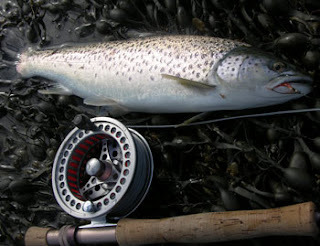 NEW research by scientists from Inland Fisheries Ireland (IFI) and Argyll Fisheries Trust (AFT, Scotland) have found that sea trout carry significantly higher levels of sea lice infestation and reduced weight closer to marine salmon farms. Scientists examined levels from more than 20,000 sea trout from 94 river and lake systems in Ireland and Scotland at varying distances from salmon farms over 25 years. Sea trout are known to remain for extended periods in near-coastal waters and are therefore vulnerable to sea lice impact. The research paper entitled Aquaculture and environmental drivers of salmon lice infestation and body condition in sea trout was authored by Dr Samuel Shephard and Dr Paddy Gargan of IFI alongside Craig MacIntyre of AFT. It was published in the journal Aquaculture Environment Interactions in October. Studies have shown that the impact of lice in farmed areas on sea trout is substantial, with increased mortality, reduced body condition and a change in migratory behaviour. Heavily liced sea trout return to freshwater prematurely to rid themselves of lice and exhibit very poor marine growth and greatly reduced marine survival. In fact, the most heavily lice infested sea trout die at sea, the study found. Data from 18 Connemara fisheries (1974 to 2014) show a collapse in rod catch over the 1989/1990 period. This collapse is linked to lice infestation from salmon farms while recovery of sea trout rod catches to pre-collapse levels did not occur. The 2017 Salmon Watch Ireland conference in the Salthill Hotel, Galway, on February 18th, from 10.30am to 5pm, is taking place at a time when the Minister has established an independent aquaculture licensing review. The review, he said, “must ensure all stakeholders can participate in a transparent licensing process and have confidence that any licensing decision complies with all EU and national legal requirements and protects our oceans for future generations”. Regrettably, his statement makes no mention of how all those legal requirements are going to be enforced. That is the focus of the conference. Stocks of wild Atlantic salmon continue to decline. The causes are multiple, some having an impact on parts of the salmon population, such as climate change, and salmon farming having a more local effect. There is general consensus among salmon conservationists that the impact over which man has some influence, eg freshwater and inshore environments, water quality, exploitation, by-catch at sea and the impact of salmon farms, need to be addressed with urgency. Where salmon farms are concerned, the settled view has to be as rapid as possible a transition to recycling and closed containment systems. 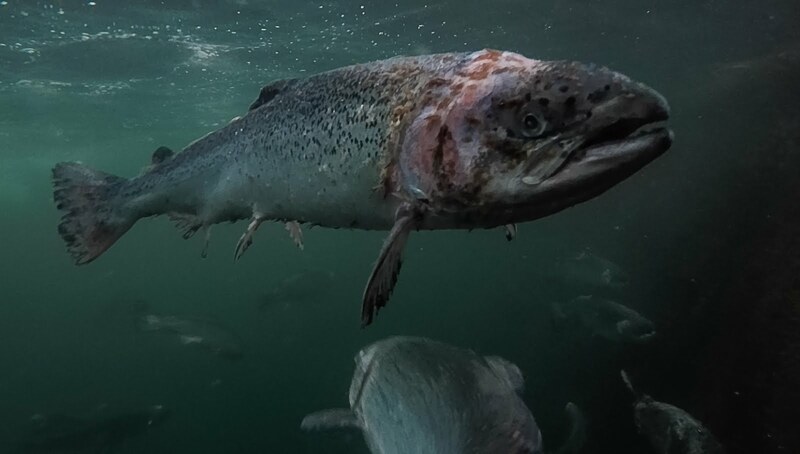 There are now sufficient examples of such systems operating in Europe and North America to confirm they are viable methods for producing high quality farmed salmon economically. 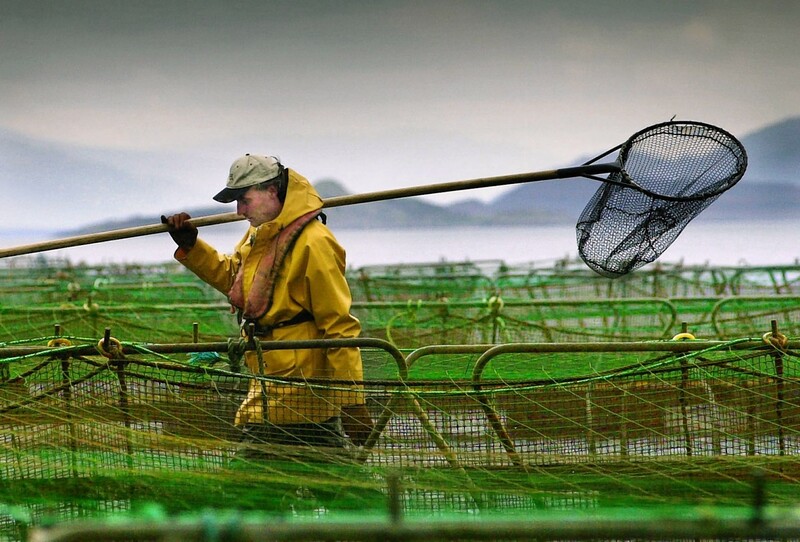 But the vast open cage salmon farming industry is not going to change to closed containment overnight; it is vital that it be regulated so as to mitigate its negative environmental impacts, including on wild salmonids. The conference will examine the following issues: Current state of wild salmon stocks; Environmental impact of salmon farming; Current legal structure for regulation of salmon farming; Case study – the Faroe Islands; Is a consensus on salmon farming regulation possible? 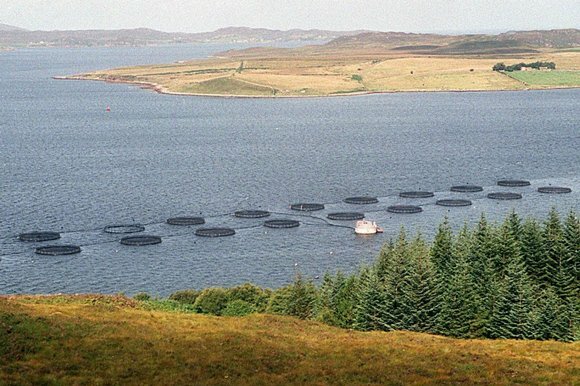 ; What needs to be done to regulate Irish salmon farms? AN oral hearing into a planned salmon farm in Bantry Bay is to take place in West Cork. The Aquaculture Licence Appeals Board (ALAB) has granted a hearing to those appealing the decision by the Department of Agriculture to give a licence for a salmon farm in Bantry Bay. 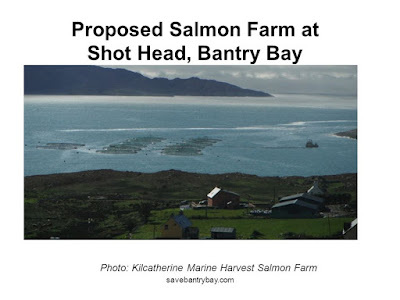 ‘It is now five years since Marine Harvest first applied for a salmon farm licence at Shot Head in Bantry Bay. During this time, hundreds of objections have been submitted from inshore fishermen, anglers, tourism operators, local businesses, residents and environmentalists,’ said Kieran O’Shea of Save Bantry Bay (SBB). The licence was approved in October 2016. Opponents of the licence have queried why the Environmental Impact Assessment (EIA) failed to acknowledge the existence of nearest river to the proposed salmon farm – the Dromagowlane. ‘This river is home to various protected wildlife species, upon which the salmon farm could have a significant impact,’ said a SBB spokesperson. They claim that Marine Harvest failed to consult locals when compiling the EIA. Opponents have also said that sea lice are a serious concern for salmon farms and the pesticides which may be used to control them. The group says Shot Head – near Trafrask, Adrigole, is ‘not an appropriate location’ for a salmon farm. No date has yet been finalised for the oral hearing. There are many, many man-made reasons salmon and sea trout populations are collapsing but now we know, and can no longer dispute the fact, that fish farming is a significant factor in this spiral of decline. A controversial West Cork salmon farm application will be considered at a hearing in Bantry next month. Marine Harvest Ireland was granted an aquaculture/foreshore licence in September 2015 to farm Atlantic salmon in a 106-acre area off Shot Head in Bantry Bay. It hopes to invest €3.5m and create up to eight jobs at the site. The licence decision took into account its location in what the Department of Agriculture, Food and the Marine said are suitable waters. It also stated the activity has potential economic benefits, and would have no significant ecological effects on wild fisheries, natural habitats, flora and fauna, or the environment generally. But the decision prompted more than a dozen appeals, including from individuals, residents, anglers’ associations, environmental groups, and Inland Fisheries Ireland. The Aquaculture Licences Appeals Board (ALAB) has now decided to hold an oral hearing to seek clarity on a number of issues. These include the nature of any risks to salmon and other members of the salmonid fish family in the Dromagowlane and Trafrask rivers. The presence of the mouth of the Dromagowlane just over a kilometre north of the proposed licence area was not mentioned in the company’s environmental impact statement or the environmental impact assessment submitted as part of the appeal to the board. It is understood the company had also appealed the conditions attached to the licence granted in 2015. Other issues to be considered at the hearing will be the associated impact on the pearl water mussel, and the robustness of the company’s integrated pest management plan and single bay management plan. The hearing is likely to take place in Bantry sometime in mid-February, with a decision anticipated by the end of May. The board may refuse the licence, back the previous decision, or grant a licence with new conditions. Save Bantry Bay, one of the appellants, welcomed the decision to hold an oral hearing, claiming there are significant weaknesses in many studies presented by Marine Harvest Ireland. The group’s concerns include the possibility of pollution, and the impact on wild salmon fisheries and on marine tourism. “The fact that ALAB now wish to examine data presented in more detail confirms that local residents, businesses, inshore fishermen, anglers, environmentalists, and tourism interests were right. 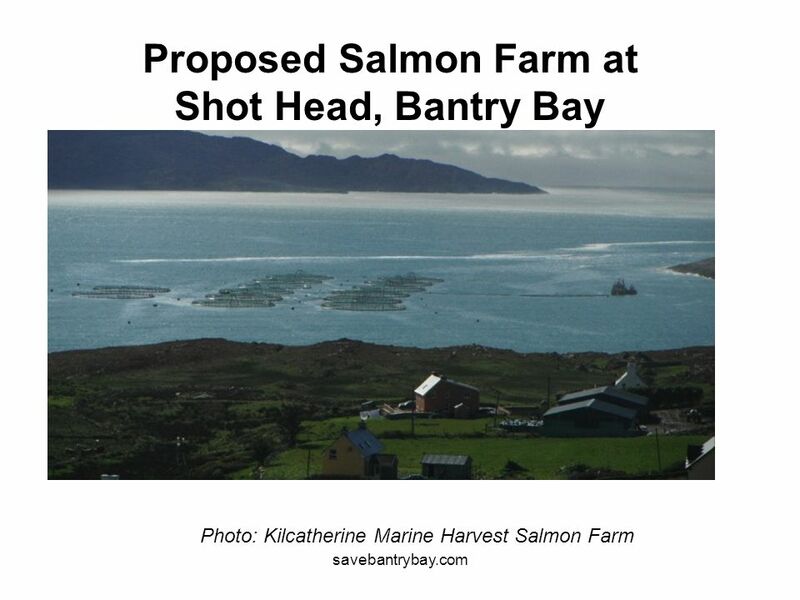 Shot Head is not an appropriate location for a salmon farm,” said Save Bantry Bay secretary Alec O’Donovan. A spokesperson for Marine Harvest Ireland said the company did not wish to comment on the organisation’s statement or on the licence application. The application was lodged in January 2012 for the cultivation of Atlantic salmon on the site near Adrigole. The company says it would employ eight people within a few years of construction and that the investment would vastly improve its existing facilities in Bantry Bay, where two of its 10 Irish sea farms are located.